The artworks representing the Three Kings, their parade or the moment they arrive to visit the baby Jesus are numerous in Christian art. At the Uffizi Gallery there are several paintings depicting this subject, made by Italian and foreign artists. We recall some of the most important ones. One of the best known works by Gentile da Fabriano is his Adoration of the Magi, or Strozzi Altarpiece, painted in tempera and oil on panel, dated 1423. The painting is very rich in colors, details and episodes. It shows a magnificent parade, which represented wealth and love for beauty of the buyer, the Florentine Palla Strozzi. Gentile masterfully depicted several naturalistic details. The Adoration of the Magi by Sandro Botticelli is a tempera on wood, painted around 1475. At that time the theme was already widespread among artists, but Botticelli carried it out with some very innovative formal choices. In the painting we can recognize the portraits of some members of the Medici family, including the young Lorenzo the Magnificent, but also Botticelli himself. 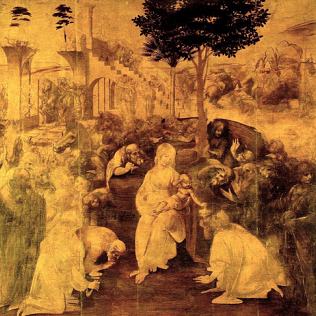 Leonardo da Vinci worked on his Adoration of the Magi between 1481 and 1482. The oil and tempera on wood painting remained incomplete. Leonardo, who knew the painting by Botticelli, also innovated the iconography of the theme. He chose a precise time of the visit of the Magi, the one in which Jesus reveals his divine nature, because he wanted to represent its profound religious sense. Albrecht Dürer painted his Adoration of the Magi in 1504: the work remained in Austria until 1793. In that year it arrived at the Uffizi through an exchange of works between museums. The work represents the style of the German Renaissance: Dürer led the intertwining of Nordic and Italian stylistic elements to a very high level of artistic quality. The artist visited Italy and studied its art. This is just a small selection of works representing the Adoration of the Magi in the Uffizi Gallery: others, by important artists, make the rooms of the museum unique.